If you’d like to add to our news/events page, please write us! Our FAQs and Issues & Demands pages are regularly updated with new information, so keep coming to check it out! The Rank and File Democracy Caucus was formed in April 2017. It was formed, in other words, in the immediate aftermath of CGSU’s disastrous recognition election campaign. Extensive campaigning notwithstanding, CGSU struggled for over three months to reach quorum (one-third of members) in a major referendum. This is atop the prior six months CGSU had delayed calling this referendum on how to relate to the results of our March 2017 recognition election. CGSU’s fall 2017 three-stage members’ retreat terminated in its first stage, due to extremely low attendance. How, at a moment when, for example, Bernie Sanders was the most popular politician in the U.S., how, with long preparation and a million-dollar campaign budget, how could CGSU and AFT-NYSUT have failed to win a recognition election on an avowedly liberal campus? because that history is still to some degree unfolding. This history exemplifies a larger process by which a once-vibrant, credible, responsive, fast-growing CGSU, courted, in 2015, by multiple national labor organizations, became by 2017 one no longer any of those things — became one, most conspicuously, no longer able to take any major decision independently from its present affiliate, the American Federation of Teachers (AFT). This would be less of a problem, maybe, if AFT and CGSU’s interests were identical. The months since our election, though, have been one more lesson in how different those interests can be. “CGSU’s” decision to negotiate, via AFT legal counsel, with Cornell. A half-year of highly unrewarding negotiations (blowing through numerous deadlines for informing CGSU’s membership of their existence). The present: a question of how to relate to the results of this referendum. (1) AFT: throughout this period, AFT was campaigning on other campuses (University of Chicago, Princeton, UPenn). Cornell was, in fact, its flagship campaign; the broader gameplan had been for Cornell to lead an elite-campus unionization surge, in the wake of the National Labor Relation Board’s 2016 ruling that U.S. labor protections do cover private university graduate workers (a ruling likely soon to be struck down). Cornell was a natural pick to lead that surge, with its campus leanings, prominent labor relations school (it is in fact AFT President Randi Weingarten’s alma mater) and active grad union already in place; its campaign’s mishandling and failure was, in consequence, monumentallyembarrassing. AFT would prefer, of course, that the story of that campaign be known as little as possible, particularly on other campuses, and for this a now ten-month legal limbo has been an ideal instrument. Again: in senses more than just formal, it’s as though our recognition election never happened — the votes still haven’t been certified, for example — and that’s just the way AFT likes it. Importantly, too, serious discussion of CGSU’s relation to AFT has been, through all this, effectively forestalled (see again the results of the member’s survey, above); even as AFT’s acknowledged misdeeds to CGSU leadership (inflating membership numbers during the campaign, for example), it’s channeled CGSU agency into sputtering backchannel negotiations, effectively deepening CGSU’s distance from members, and its dependence on AFT. All of this is important to bear in mind in the days to come: action on the referendum votes to file ULPs will involve many of the same players and probably exacerbate these dynamics. (2) Cornell University: for Cornell, too, which cultivates an image as the “liberal ivy,” it would be better if CGSU’s recognition election had never happened. Not least because Cornell did, in the course of that campaign, repeatedly undertake some hostile, lamely ugly, and very probably illegal messaging. That messaging would be the object of an Unfair Labor Practices (ULPs) filing, such as CGSU’s Organizing Committee (OC) voted unanimously (with the exception of members abstaining on the principle that this should be a union-wide decision) on April 3rd 2017 to file. And it’s interesting that not that OC decision, but the following week’s OC decision to negotiate with Cornell, was acted upon. How AFT relates to referendum results will be instructive; they’ve already (elaborately) balked once at a CGSU impulse to file ULPs that most observers agree would be a slam dunk. This may be because they take seriously Cornell’s intimations, in negotiations, of having evidence of AFT’s election misconduct that Cornell might invoke or release in response. In any event, AFT and Cornell would both prefer the past year-and-a-half receive as little general scrutiny as possible. This is probably why, in the timeline below, we find AFT’s legal representative in sometimes greater sympathy (and communication) with Cornell’s representative, Paul Salvatore, than with CGSU’s. (3) CGSU: CGSU’s most immediate task, we’ve argued, remains some earnest reckoning with its history and relationships, particularly with AFT. It lost and broke the trust of hundreds of grads — who told CGSU and AFT in person, emails, op-eds, etc., i.e. in every way they knew how that they felt harassed, unheard, misled, instrumentalized. CGSU needs to explain how this happened, and how it won’t happen again; proposed technocratic fixes — a software change, a steward system (as though the issue, last spring, was that CGSU wasn’t getting member feedback) — are, in the meantime, evasions. Root problems have even arguably worsened: given CGSU’s current state, any imaginable recognition campaign would be more AFT-dependent and less member-driven than the last one. In short: the past ten months have eminently served the interests of two organizations, at the expense of the third. Negotiating on behalf of a party you don’t want to know you’re negotiating on behalf of isn’t exactly “negotiating from a position of strength.” Right? So why would CGSU enter into negotiations with Cornell without informing, let alone consulting, its members (particularly given that “negotiating with Cornell” is, in CGSU’s Constitution, a decision for membership to make, and that it has a much better card — namely ULPs — to play)? Why would CGSU pose to members the three options of (1) engaging with Cornell, (2) filing ULPs, or (3) certifying election results, only six months after they’d first appeared and already then been promptly decided amongst (and then corrected by AFT and then decided amongst again), by CGSU leadership? Why would CGSU conduct a referendum with wildly uncertain membership lists? Why would AFT counsel undercut CGSU’s own offer to Cornell, without CGSU authorization, and without awaiting a counteroffer from Cornell, by submitting a weaker one? Grad workers should, of course, continue to organize to take care of each other, and of others. What title CGSU-AFT has to a role in that process is an increasingly open question. Serious discussion in CGSU of CGSU’s affiliation relationship to AFT is profoundly overdue. CGSU’s principal accomplishment and function, over the past nine months, has been to shield its election campaign and AFT from broader scrutiny and criticism. On this one count, CGSU — outwardly directionless and ineffectual — has been quite effective. April 3rd, 2017: After CGSU’s March 27-28 recognition election vote, CGSU’s Organizing Committee (OC) held a special Monday meeting to discuss possible legal responses to the Cornell administration’s election misconduct. American Federation of Teachers’ (AFT) legal counsel C.C., assigned at around this time to work with CGSU, informed CGSU’s OC that any unfair labor practice complaints (ULPs) would have to be filed within 7 days of the beginning of the election. The urgency of the decision was framed as precluding consultation with members. An option of withdrawing a ULP complaint after its filing, if membership so decided, was acknowledged. And partly on this principle CGSU’s OC voted overwhelmingly for AFT legal counsel C.C. to file ULPs addressing Cornell’s conduct prior to and during the recognition election. Several present abstained, on the principle that this was a decision, ultimately, for the membership. April 5th, 2017: AFT convened an urgent OC phone-conference meeting (with one hour notice), to “debate and discuss” “a development.” This was reported as the following: AFT legal counsel informed both Cornell and the election arbitrator of CGSU’s intention to file ULPs, whereupon the arbitrator suggested that CGSU and Cornell first try negotiations. Those on the conference-call agreed to hold off filing ULPs, at least until AFT’s president and Cornell’s legal counsel (former Cornell ILR schoolmates) could, in some private and preliminary fashion, talk. Negotiations would not be, in any obvious sense, power-building for CGSU, so high negotiation benchmarks tended to circulate: if Cornell doesn’t give us card check (i.e., recognize CGSU on the basis of cards signed, foregoing the entire election process), we’ll close the door in their face, etc. On an April 8th conference call, AFT’s president openly assessed card check as unlikely. Still, negotiations were recommended. April 11th, 2017: CGSU’s OC decides to negotiate with Cornell. April 18th, 2017: Negotiations are discussed at CGSU’s General Assembly (but not explicitly acknowledged in the GA email, or in any other union-wide communication; the vast majority of CGSU members would still at this point have had no way of knowing they were going on). From the minutes: “Other options exist, but if we don’t see anything coming out of negotiations within a month, we aim to file the objections [ULPs].” The GA audience repeatedly voices concern that a month may be unduly long. April 23rd, 2017: first UMC call: discussion of what the union would want in a new code of conduct agreement. April 25th, 2017: AFT counsel sent a draft first proposal to the UMC. May 1st, 2017: AFT counsel received all comments and suggestions from all UMC members. The UMC was unanimous regarding the language of the first proposal, and C.C. wrote at 2:25pm that she would send the proposal to Paul by close of business that day. May 2nd, 2017: AFT counsel wrote to the UMC saying that she thought it would be good to have AFT President Randi Weingarten look over the proposal. May 4th, 2017: Not having heard anything further from AFT counsel, a member of UMC, a UMC member enquired about the status of the proposal. 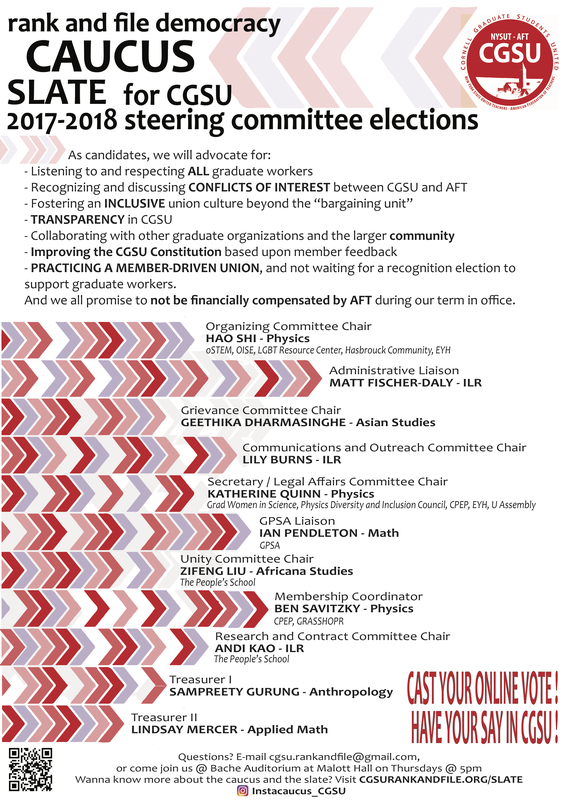 May 5th, 2017: AFT counsel replied to the UMC that she had received comments from Randi Weingarten the day before, along with a suggestion that CGSU make a concession to allow Cornell’s president to send out one official communication to the graduate community. Several members of the UMC voiced concern because (1) the entire UMC had agreed to the language to be sent out, and it wasn’t clear why Randi Weingarten should be overruling that decision, and (2) beginning with such concessions, before having even heard back from Cornell, seemed an odd tactic. One UMC member (M.B.) advocated for the concession to be included. The rest of the UMC was firm on sending out our proposal to the university as soon as possible. May 6th, 2017: AFT counsel wrote to the UMC and said that she would send out the proposal without the concession that day. May 7th, 2017: AFT counsel wrote to the UMC that she had sent out the proposal. May 9th, 2017: AFT counsel called Cornell’s representative, Paul Salvatore, who said he would share the proposal with the university, but did not think they would accept it. May 10th, 2017: UMC call with AFT counsel. May 29th, 2017: UMC call with AFT counsel to discuss Cornell’s slow response. June 2nd, 2017: UMC received, from AFT counsel, Cornell’s counter-proposal. June 11th, 2017: UMC members provided comments/edits on the university’s counter-proposal. June 15th, 2017: UMC call. July 14th, 2017: UMC call to discuss communications provisions left out of the first two proposals. August 4th, 2017: AFT counsel reported an upcoming phone call with Cornell’s representative on Tuesday, August 8th, 2017, who’d indicated the the university’s counter-proposal should by then be ready. August 8th, 2017: AFT counsel reported that Cornell had offered no counter-proposal. August 9th, 2017: UMC call with AFT counsel. August 17th, 2017: UMC call with AFT counsel. August 20th, 2017: UMC receives from AFT counsel a draft version of their proposal, which was intended for sending that evening. August 21st, 2017: Barb Knuth comments on CGSU during new student orientation. August 23rd, 2017: AFT counsel wrote to the UMC that she did not send out the proposal because she needed to talk to Paul Salvatore after Barb Knuth’s comments. August 24th, 2017: AFT counsel wrote to the UMC that she couldn’t catch Paul on the phone that day, and that she would call back in the afternoon the next day (August 25th, 2017). August 25th, 2017: AFT counsel wrote to the UMC that she still could not catch Paul. A UMC member, unclear if the proposal that should have been sent out on 8/20/17 actually had been sent out, wrote for clarification. August 26th, 2017: AFT counsel wrote back to the UMC, reiterating her view that she should talk first to Paul Salvatore, before sending out the UMC’s proposal. M.D. voiced concern that AFT was stalling negotiations, suggesting a Monday (8/28/17) deadline for the proposal to go out. AFT counsel replied that she would send the proposal out on Monday. She inquired, too, fir the first time, whether the UMC would compromise on its previously agreed-upon bottomline: “Columbia protection,” i.e., protection against any (expected) National Labor Relations Board withdrawal of labor protections for private university graduate workers. Arguments about whether the UMC actually agreed on that bottomline ensued. A UMC call was scheduled for that coming week. August 30th, 2017: AFT counsel call: a second pitch for concessions on Columbia protection. AFT counsel urged that a new proposal with these concessions, termed “half-rights,” be sent out, voiding the UMC’s prior proposal before the university had even responded. T.D. indicated that, together with M.D. and H.S., he was prepared to communicate recent events to membership. AFT director M.A.T. decided AFT would fight for the full-rights Columbia protection. September 11th, 2017: AFT counsel summoned an emergency UMC call. She pressed the UMC for the third time for compromise on full-rights “Columbia protection.” The UMC did not compromise; AFT counsel suggested the decision be taken to CGSU’s GA. In the course of the call, it emerged that AFT counsel had proposed half-rights to the university, undercutting the UMC’s extant proposal. This actionwas problematic and unethical because (1) the UMC’s bottom-line of full-rights was utterly clear, and explicit, and (2) AFT counsel had long characterized the source of the half-rights proposal as the university. September 12th, 2017 - September 14th, 2017: It emerges that two UMC members, M.B. and E.S., had been organizing for a vote at the General Assembly (GA) to submit a half-rights proposal undercutting the UMC’s own bottomline, even before AFT counsel had suggested posing the question of half-rights in a GA.
September 14th, 2017: Aware that the GA would possibly be making a substantial decision with an extremely small number of CGSU members, M.D. and H.S. brought printout histories of the negotiation process, noting how ridiculous it would be to send a counter proposal with half-rights language before the university had responded to our previous counter proposal. AFT director M.A.T. turned then to damage control, siding against the “half-rights lobby.” The GA ultimately made no major decisions on what to do next: It voted instead overwhelmingly (37 to 3) to initiate a referendum process so that all CGSU members could have a say in how to proceed with the results of CGSU’s March 2017 union recognition election. See details on our shared principles and positions, and individual statements from our candidates. If you want to know more about what a slate is, check this out. We want to give everyone greetings on international workers day. This is a day to remember that the rights and freedoms that we take for granted were won by long hard struggles. This is a day to remember that despite our difference, and our unique situations, there is sameness that connects what we are doing with workers across the country and world. This is a day to remember that the simple idea, of having a say in how decisions are made in the workplace, comes from and is part of a history. Finally, it is a day to recognize that it is only our voice, as a democratic union of workers, and not that of any body outside of us, that can protect our interest. The general assembly (GA) took place with about 60 in attendance Tuesday evening. The first hour and a half were spent discussing the election—many points brought up resonated with the concerns of the RFDC. The most important section of the meeting was the appeal of a grievance concerning conflicts of interest. Four months ago, a member filed a grievance to address the conflict of interest presented by elected members of CGSU’s Steering Committee (SC) being paid part-time by AFT. The conflict of interest is clear: CGSU and AFT are independent entities, and paying an elected leader of CGSU can, despite that person’s character or best intentions, compromise the independence of CGSU. There are a number of incidents during the recent campaign (most notably the seizure of CGSU’s email and website by AFT) that illustrate the practical importance of CGSU’s independence. After four months of delay, CGSU’s Steering Committee dismissed this grievance, claiming that there was “no grievable action.” Under CGSU’s constitution, any grievance not resolved amicably must go before the membership: the GA can by majority vote decide to take any action to resolve the issue. The GA’s facilitators corralled discussion to limit the voting options to two: (1) SC members currently paid by AFT resign and a constitutional amendment addressing this issue be drafted, or (2) the Steering Committee’s dismissal of the grievance is upheld. Other suggested resolutions - for example, that any AFT employees on the SC serve out their current term, but that no AFT employee serve on the SC in the future - were dismissed. Given options (1) and (2), then, the GA voted for the latter. A transcript of the minutes are available to CGSU members through CGSU’s website. Please email cgsu.rankandfile@gmail.com or cornellgsu@gmail.com if you’re a member and want to know the password. The primary objective of Cornell Graduate Students United (CGSU) is to unite graduate students to collectively advocate for our rights as workers. This cannot be done effectively without member input and participation. RFDC strongly and actively supports the provision of open forums such as that planned for this Monday, at Ives Hall, as well as the accompanying survey to collect your feedback on the strengths and weaknesses of the organizing campaign, your thoughts on where to go from here, our affiliation with state and national unions, and your general impressions of CGSU as a whole. The next CGSU General Assembly is at 6:30pm on Tuesday, April 18th, 2017. The location is G10 Biotech. The CGSU Steering Committee election is coming up! The role of Steering Committee members are described here. Please also consider nominating yourself for the election committee, which is the body that runs and ensures a fair election. You can do so by emailing CGSU. The CGSU recognition election of March 2017 was inconclusive, with 856 yes votes, 914 no votes, and 86 challenged ballots. While it’s clear that CGSU is behind in the vote count, the election result has still not been certified by the arbitrator at the time of this writing. We believe CGSU could have conducted a better, more member-driven campaign, but we also believe it was clear that Cornell Administration engaged in election misconduct by sending out several emails that violated federal labor law and the code of conduct signed between the administration and CGSU. The CGSU Organizing Committee has been discussing, for the past two weeks, how to proceed with the legal and organizing challenges currently facing CGSU. The OC has been divided as to how to proceed. Some of our caucus supporters advocated for bringing the issue of how to proceed to the general membership as our Constitution requires. Several other members of the OC insisted that the OC has the power to make the decision, and some have even advocated suspending the constitution. We believe that CGSU membership can and should be informed of and engaged in making the critical decisions facing us both in the legal and organizing domains. RFDC is committed to this and we encourage you to get involved and help us ensure CGSU is a democratic, member-driven union!